Now is the time to get your home spring cleaned and to take advantage of our SPRING CLEAN PACKAGE. We provide both Home and Office Cleaning Services. All our cleaners are full time cleaning staff, and all are trained, vetted and insured. If you are an existing customer or you would like to discuss all the aspects of setting up a cleaning service, please contact us using one of the links given below. Please complete this form and click the Submit message button. You will be contacted to discuss your enquiry as soon as possible. Our mission at Kingmaid is to provide excellent domestic cleaning services to the residents of Cheshire; areas such as Bramhall, Wilmslow, Hale, Alderley Edge and all parts of Greater Manchester and Lancashire. 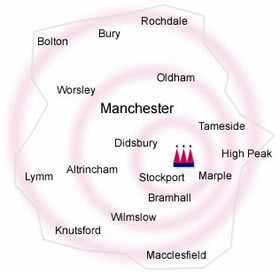 With our locally based teams we also clean in other areas such as Rochdale, Bury, Hayfield, Worsley, Altrincham, Cheadle Knutsford, Lymm, and Macclesfield. Kingsmaid brand products are not tested on animals and are kind to the environment. They have the Green Seal Approval. Unit 30, Chadkirk Business Park, Romiley, Stockport, Cheshire, SK6 3NE.